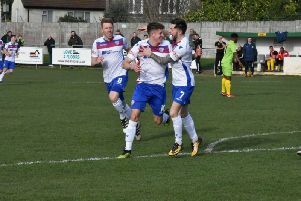 AFC Rushden & Diamonds and Banbury United shared the spoils at Hayden Road. A game doesn’t need a whole host of goalmouth action to make it entertaining. This one had the makings of a decent contest and it didn’t disappoint. Right from the start, it was played at a high tempo with Banbury setting the initial pace before Diamonds played themselves into the game. There weren’t a huge amount of chances, indeed you could probably count the number of saves both goalkeepers had to make on one hand. But that certainly didn’t make it any less entertaining. It was competitive stuff, a tactical battle at times and both teams did their best to play some decent football along the way. Goalmouth action was at a premium but this game showed there is a lot more to football than that. Andy Peaks is spoilt for choice when it comes to his squad at the moment. This has been a regular topic of discussion during my weekly chats with Andy Peaks. He’s in a fortunate position at the moment. There is pretty much a clean bill of health at Hayden Road and it has created a nice problem for the Diamonds boss. The likes of Joe Curtis and Sam Johnson have waited for their opportunities and have seized them in their last two matches. There is serious competition for places at the present time and, as proven in this game, Peaks was able to make changes without weakening things whatsoever. It’s a situation every manager wants to be in. Every player knows they need to perform because if they don’t you can guarantee there is someone waiting in the wings to take their shirt off them. Zack Reynolds has, arguably, been Diamonds’ best signing for this season. I am sure I have touched on this already but it’s worth saying again. Right-back Zack Reynolds picked up another man-of-the-match award as he enhanced his growing reputation at Hayden Road. The summer signing has made the position his own in the last few months and is getting better as the campaign goes on. Solid defensively and a real threat with his pace when attacking makes him the perfect example of a full-back in the modern game. The reaction since New Year’s Day has been impressive. The heartbreaking last-gasp defeat at Kettering Town on the first day of 2019 could have easily broken the spirit of this Diamonds team. But, unsurprisingly, it just seemed to add more fire to the bellies. The reaction since that setback has been excellent with two wins and two draws ensuring that the team’s overall form remains good. Diamonds have lost just twice in their last 15 matches, which is a highly impressive effort. It’s easy to forget that this is a club and a team who are new to this level. But they continue to impress, showing no fear against any opponent. If that sort of form carries on over the next couple of months then we could be in for an exciting finish. The race for the play-offs is intriguing and Diamonds remain very much part of it. There is plenty to play for between now and the end of April. While the top two have pulled away from the rest, the battle for the play-off places remains extremely tight. One manager from another club pointed out just how close this division after a weekend that saw only one match being decided by a two-goal margin. There isn’t a lot to choose and that means there is still a big opportunity for Andy Peaks and his players. Despite being three points off the top-five at the moment, Diamonds are in control of their own destiny when you look at the fixtures they have left, especially at Hayden Road. There are some big games coming up and if they can pick up some big results, they will give themselves a huge chance of having an extended season. Any fears of relegation are now long gone. It would be great if they can sustain their play-off challenge and, at the moment, there’s nothing to suggest they can’t.